Credit notes are similar to invoices, except that they are used to reduce the amount owed to you by a customer. A credit note relates to a particular customer and remains open until its balance is fully applied to raised invoices (reduced the amount payable) or refunded in cash. You issued an invoice and the customer noticed (before paying) a quantity was too high. 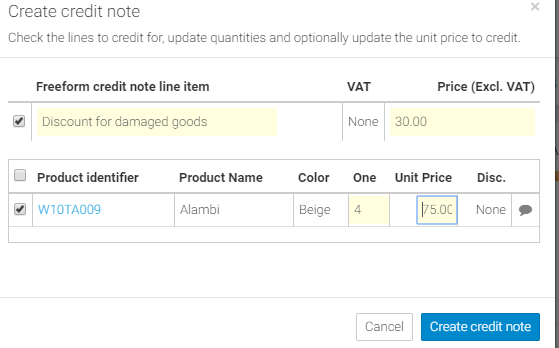 Rather then delete and recreate the invoice, you can create a credit note for the over invoiced quantities or for the difference in the value of certain products. The entire value of the credit note should then be applied to the open invoice, reducing the balance payable. You issued an invoice, the customer paid and then returned some or all of the goods. You should create a credit note for the returned goods. You can then either immediately create a refund for the value of the credit note (and transfer the cash) or leave the credit note open to apply to some future invoice for this customer. A customer has overpaid for a certain invoice. When entering the payment for the invoice, Stitchex will prompt you to create a credit note for the value of the over-payment. You can then either create a refund for this credit note (refunding the customer immediately) or leave the credit note open to apply to a future invoice. 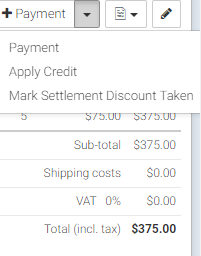 In the above example, you can see we provided a discount for damaged goods for the customer. And, we gave them a credit for 4 of their products that were damaged. Find the invoice you would like to apply an open credit note to -- it does not have to be an invoice associated with the order where the Credit Note originated. It does need to haven a Total Outstanding balance. 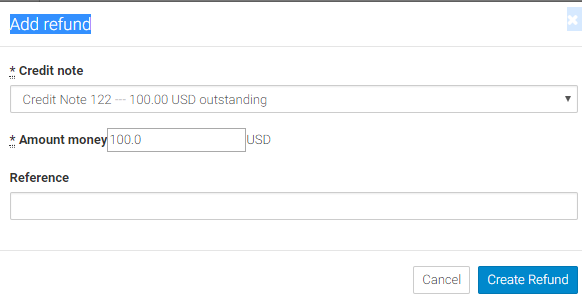 Select Apply Credit from the drop down Payment menu on your Invoice (Figure 4). Specify the amount you want to apply for credit against this invoice (Figure 5). 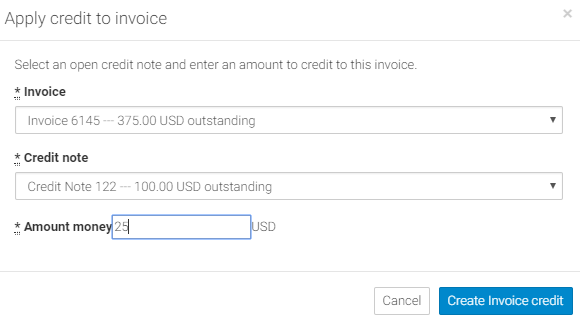 Click "Create Invoice Credit" button (Figure 5). Click the "Apply credit" link to open the Apply Credit Note dialog. Choose the open credit note from the drop-down and enter the value you would like to credit, up to the total remaining credit left on the credit note. Applying an over-payment to an invoice will result in a "Over-payment" being created. 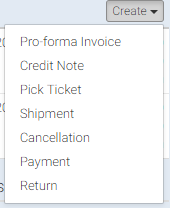 Over-payments are listed at the right of the sale workflow beneath credit notes. Over-payments act like credit notes in that they can be applied as payment to future invoices. If you need to provide a customer with a refund (you are issuing a credit note for a paid invoice and don't wish to carry a credit over to a future sale) you should create a credit note then record a refund to reduce the remaining credit and close the credit note. You can enter an optional reference and an amount refunded. Refunding (or applying) the entire value of the credit note will close the credit note.